The Rodin Museum has the largest number of the works of Auguste Rodin – the great French sculptor – outside of Le Musee Rodin in Paris, France. Most notably, you can see a version of his most famous sculpture, The Thinker. Fittingly, it is located on the Paris-inspired Benjamin Franklin Parkway - the home of many of Philadelphia's arts and cultural attractions. Rodin's life bridged the 19th and 20th centuries, as he was born in 1840 and died in 1917. His genius for sculpture was recognized during his lifetime, and his reputation has only increased in the near-century after his death. He had a profound influence on generation of artists, due to his deep interest in myths, especially classical ones, and in expressing the inner dimensions of the human mind. Rodin achieved this feat, most famously, in The Thinker (or as it is known in French, Le Penseur) one of the most famous sculptures in world history. The original version of The Thinker, sculpted in bronze and marble, is at Le Musee Rodin - it was completed in 1902, and first exhibited to the public in 1904. There are ten original bronze castings of it in North America, including the one outside of the Rodin Museum. Closed Mondays and some holidays. There is no formal admission charge, but a donation of $5.00 per person is recommended by the Rodin Museum. You can take a self-guided tour at any time. However, we would strongly recommend that you take the guided tour (which is free, and no additional donation is requested). Guided tours are available at 1:30 PM, on Tuesday, Thursday, and Sunday, as well as the first and third Saturday of each month. If you're interested in the guided tour, join the group assembling in the Main Entrance Hall, at the right time. If you are only in town for a short amount of time, we would not view touring the interior as a priority, unless you are an avid art enthusiast. The Rodin Museum is somewhat off the beaten tourist path at 22nd and the Parkway - unless you are also going to the Philadelphia Museum of Art - which is located at 26th Street and the Benjamin Franklin Parkway, and which also administers the Rodin Museum. If you are doing a whirlwind tour of the Parkway attractions, getting your picture taken with The Thinker, outside, is probably all of the time you need to spend there, since your time is finite and Philadelphia attractions are many. And you can do that quickly. Of course, you can also enjoy the tranquil Rodin Gardens and its Reflecting Pool, and they make a good pit stop while walking up the Parkway - 60,000 people visit them every year. When in season - from May 1 to October 31 - the purple Phlash Trolley is your best choice to get there, as it has a stop nearby. You can board it at any one of its 27 stops around Center City. However, it ceases operations for the day, around 5:30 - 6:00 PM, or so, depending on circumstances, and it only runs six months of the year. Fortunately, in addition to the Phlash, SEPTA offers a variety of year-round options for the visitor heading to the intersection of 22nd Street and the Ben Franklin Parkway. You can take the Blue Line - known officially as the Market-Frankford Line, and unofficially as "the el", short for "elevated train" - to its 15th Street Station. You disembark at 15th and Market Streets. From there, you can take the Phlash when in season, or SEPTA bus service up the Parkway. Or you can walk - it's a reasonably long walk, but if it's a nice day, walking up the Parkway is very enjoyable. You can also take the Broad Street Subway - also known officially as the Broad Street Line and the Orange Line to one of two stations. You can get off at Race/Vine, which will put you either at the intersection of Broad and Race Streets, or Broad and Vine Streets. Walk west along Race Street - i.e., where the numbers streets are going up, not down - until you reach the Ben Franklin Parkway, and turn right, and continue to the Rodin Museum. You can also get off at the City Hall station, which places you at Broad and Market Streets. You'll see the broad Parkway, since it ends at City Hall. From there, just follow the same directions as for the Blue Line, above. If you are coming from one of the outlying Philadelphia neighborhoods, or from the Pennsylvania or New Jersey suburbs, your best option is likely SEPTA Regional Rail service. Nearly every inbound train will stop at Suburban Station - located at the intersection of 16th Street and John F. Kennedy Boulevard. When you leave the platform, follow signs for "17th Street". Once up on the surface, you can take the Phlash, SEPTA bus service, or walk up the Parkway to the Rodin Museum. If you are traveling to Philadelphia via Amtrak, you will almost certainly be getting off at Amtrak's major station in the region, the architecturally impressive 30th Street Station - located at 30th and Market Streets. From there, you have two options. One is to use your Amtrak ticket - which is valid, on the same day - for a free trip both to and from either Suburban Station, or Market East Station - located over at 11th and Market Streets. In this case, you want to get off at Suburban Station. After you come up from the Amtrak platform, follow signs for "SEPTA Regional Rail". Once you've arrived, ask a SEPTA employee to direct you to an eastbound train heading toward Suburban Station. Due to the frequency of service, you shouldn't have to wait more than a few minutes. Double-check with the SEPTA conductor, before you get on the train - ask, "Is this train going to Suburban Station?" If so, you're fine. You will only be on the train for one stop, and it will be about a five-minute ride. When you get off at Suburban Station, just follow the directions above to get to the Rodin Museum. 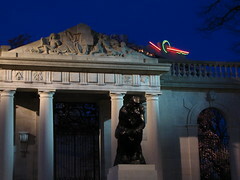 Your other option - particularly if you are pressed for time - is to take a cab from 30th Street to the Rodin Museum. Cabs are easy to get outside 30th Street - just walk outside, and it isn't a very far trip to 22nd and the Parkway. While this will cost more, it's probably worth it, because you will get there a lot quicker, and more conveniently than by going to Suburban - since once you get to Suburban, you still have to go from 16th Street all the way up to 22nd Street. So we'd recommend the cab. The Rodin Museum is the result of the philanthropist Jules Mastbaum, who had made his fortune in the then-fledgling movie theater business. Mastbaum had begun a collection of Rodin's sculptures in 1923, with the main goal being to create a museum to house the works and display them to the public. Remarkably, in just the three remaining years of his life - he died in 1926 - Mastbaum had assembled the largest collection of Rodin's works, outside of Paris itself. Mastbaum had contracted with two distinguished French architects - Paul Cret and Jacques Greber - to design a museum and gardens for the collection, although Mastbaum died prior to seeing his dream open to the public. The Rodin Museum opened in 1929, three years after his death. In addition to The Thinker, the most famous sculptures in the Rodin Museum are The Burghers of Calais, Apotheosis of Victor Hugo, and somewhat ominously, The Gates of Hell, which took Rodin 37 years - and it was still incomplete (really, it did; he worked on it for the last 37 years of his life, from 1880 - 1917, but it remains unfinished). If you'd like to leave the Rodin Museum, and return to the Philadelphia Museums main page, please click here.